Just two weeks after the Dunlop MSA British Touring Car Championship showcases the latest generation of stars at Donington Park, the circuit will play host to a fantastic selection of historic ‘tin-tops’ from the 1950s to the 1990s, with what promises to be a hugely entertaining group of Touring Car races at the Donington Historic Festival (30th April, 1st & 2nd May). Touring Cars are guaranteed crowd-pleasers, and the Festival has grids covering everything from the earliest days of the BTCC (or BSCC as it was originally known) right up to the Super Touring era. Adding to the excitement is the fact that a number of cars at the Festival originally competed in period, as did some of the drivers, including John Cleland, Steve Soper and Patrick Watts. 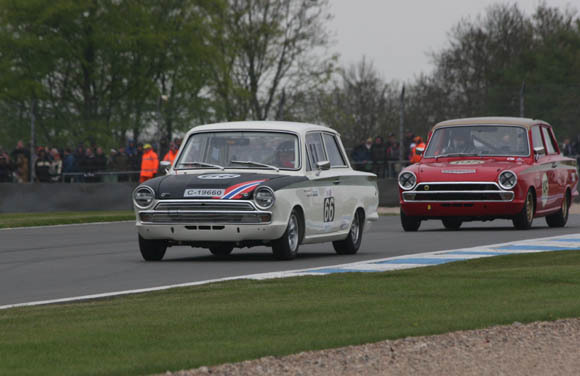 Donington Historic Festival Touring Car action begins on the Saturday, with the Historic Touring Car Challenge, incorporating the new Tony Dron Trophy for Group 1 cars. 1980s and ’90s Touring Car ace Steve Soper will share JD Classics’ 1973 Ford ‘Cologne’ Capri with Chris Ward, racing against Mark Smith in the BMW M3 E30 that Soper campaigned in 1989/90. 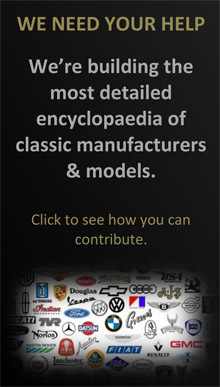 The grid also includes David Clark’s Luigi Racing Bastos Chevrolet Camaro in which Reine Wisell, Claude Bourgoignie and John Cooper took pole at Spa in 1981, and Nigel Garrett in the Rover SD1 that Andy Rouse drove to victory in the 1984 BTCC. Touring Car content on the Sunday kicks off with the U2TC for pre-66 under two-litre Touring Cars. 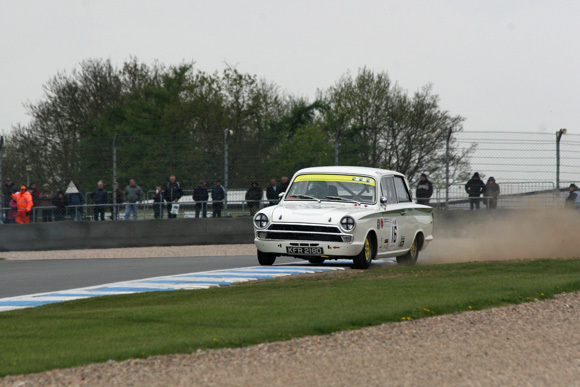 In 2015, over half of the cars in this race were Lotus Cortinas, and a newcomer to this year’s Lotus Cortina contingent is Steve Soper, driving the car that Matt Neal and Gordon Shedden previously raced in U2TC. Last year’s winners, the Banks brothers, will defend their title in their Alfa Romeo Giulia Sprint GTA, while crime writer Peter James will generate thrills of a different sort, in his BMW 1800Ti. 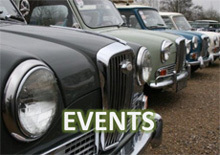 On the Bank Holiday Monday, 2nd May, the Super Tourers return for their second race, while the HRDC ‘BTCC Celebration 1958 – 1966’ showcases the early history of the British Touring Car Championship. Steve Soper features yet again; partnered in this pit-stop race by David Cuff in the latter’s immaculate Lotus Cortina Mk.1. The nemesis of the Lotus-powered Ford is likely to be the Italian ‘Homologation Special’ that is the Alfa Romeo GTA of Neil Merry. 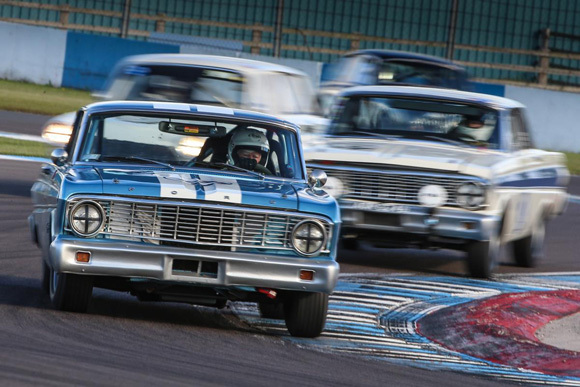 Mighty V-8 power will be used to its full potential by such leviathans as Chris Clarkson’s Ford Falcon Sprint and the Mustangs of Nicholas Ruddell and Pete Hallford. 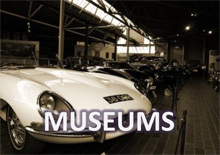 Representing the 1950s era will be Geoff Gordon in his blisteringly fast 1959 Alfa Romeo Giulia Ti Berlina, Ding Boston in the Oxford University Motorsport Foundation-run Riley 1.5 and a gaggle of HRDC Academy A30 and A35 racers.